You may have seen our recent post on the Blekko search engine. Well, today they announced a partnership with semantic search engine DuckDuckGo in an effort to broaden both services’ offerings, including Blekko‘s search results spam filtration with “slashtags” and DuckDuckGo‘s “Zero-click Info” feature. 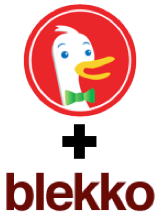 Blekko will now power DuckDuckGo’s search results for the following categories of searches: health, colleges, autos, personal finance, lyrics, recipes and hotels. These are the initial categories in which Blekko is automatically applying its slashtags to improve results. For example, searching “cure for headaches” on DuckDuckGo will provide results only from the top quality sites in the blekko /health slashtag. Users will also be able to utilize Blekko’s unique /date functionality, which serves up not only the most relevant, but also most recent results in date order. As part of this partnership Blekko users will have access to DuckDuckGo’s “Zero-click Info” on a site by site basis. Zero-click Info helps users find the most relevant information on sites and search terms without having to click on search results. On Blekko, the site information can be accessed by clicking the “info” button in the second line of each of search result. “Both our companies share the same mission of eliminating spam from search so that users get information from the best and most relevant sources on the Web,” said Rich Skrenta, CEO of Blekko. You can learn more about how to use Blekko by visiting their website, or you can read our recent post on Blekko here. Learn more about DuckDuckGo here. Happy Sourcing!